Handy aluminium carabiner clips. Ideal for securing things quickly to your rucksack, or for your dog's lead for example. Once you've got some you'll be thinking of all sorts of ways to use them! Available in 6mm, 7mm and 8mm diameters. Assorted colours. The expanded picture is them actual size. Please note these are for general outdoor use. They are not suitable for climbing and are marked as such. As the coloured carabiners are only supplied in assorted sizes on cards we have sourced some Black 8-shaped ones for larger quatities where volume not colour is important. Please contact us at page bottom if you'd like a price on quanities over 20. 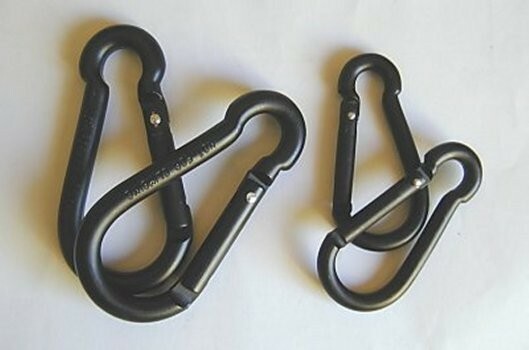 Black Carabiner 8-shaped - 6mm. Black Carabiner 8-shaped - 8mm.